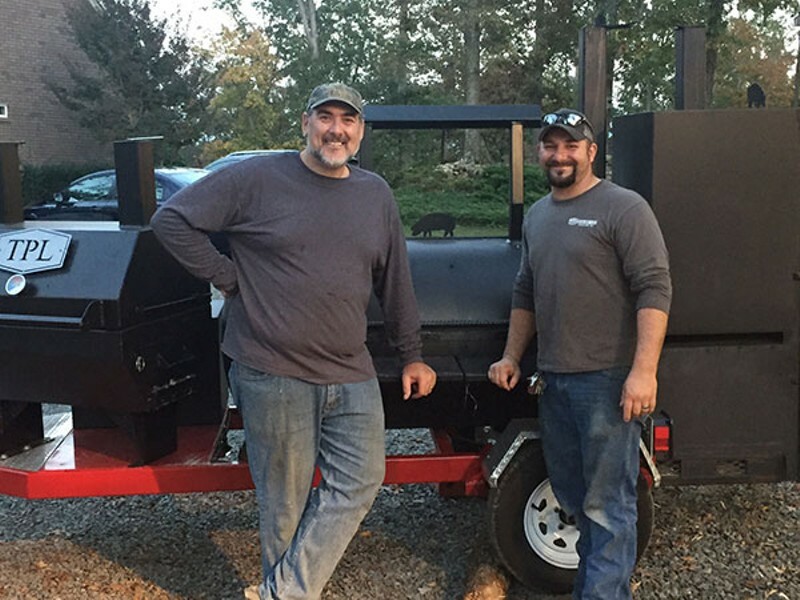 For Charlotte-area residents Steve Dyer and Josh Lambert, cooking barbecue comes natural. They do it in their backyards on a regular basis, filling the bellies of family and friends who are more than happy to serve as guinea pigs. But for the upcoming Polar Pig Cook-Off, held in downtown Mt. Pleasant, NC, Nov. 11-12, they are skipping the amateur backyard division and going straight in to competing with the barbecue big dogs in the grand masters professional division. Since the small town approximately 40 minutes northeast of Charlotte is joining up with the Kansas City Barbecue Society to host the competition, there will be folks from all over the region coming to compete for bragging rights in specific categories and for overall points. Dyer and Lambert will be cooking chicken, pork ribs, pulled pork and brisket. Lambert, who builds smokers via his biz JL Custom Smokers, and Dyer, a land surveyor by day who grills regularly in his free time, will be critiqued for taste and presentation by a panel of judges. Although attendees won't be able to sample competition offerings, they can go Friday to taste chicken wings, which will be cooked up by teams participating in Saturday's competition. For $10, folks can try 10 wings and vote on their favorite. On Saturday, there will be barbecue provided by local fire departments and other food available for purchase. Money raised from the event will go to St. Jude Children's Research Hospital, Toys For Tots and Mt. Pleasant Food Ministry. Creative Loafing: What are you hoping to accomplish through the competition? Steve Dyer: Josh [Lambert] is striving to get into the barbecue business and wants to keep building the smokers and get more into catering. I've dabbled in it a little bit and realized I don't want to do that, my catering days are behind me, so I'll just keep cooking for anybody that comes over. I just don't have a passion to do it for a living, but I want to compete in everything I do. I like to cook and everybody likes to eat and I guess it's the competitive nature of my being. The first thing I want to do is try to win a prize. Once I win a prize, it's all over and I'll move on to something else. I always think that my food is good, so it's good to have somebody judge it that's not just your friends. You always wonder if your friends are really telling the truth or if they just want you to keep cooking instead of them, so they always tell you it's good. Is there a specific thing you'll be cooking that's been more popular with friends? Everybody seems to really like the chicken that we've come up with, but cooking for your friends is very different than cooking for the competition. The judges are going to take one bite of your food and judge it, so you want to make that bite really pop. It's a little bit spicier with some different layers of flavor. What kind of barbecue do you like and where's your favorite place to eat it? I tend to like things really flavorful and moist. I like the competition style barbecue. That's my flavor profile. If you tend to go around here to a local barbecue joint, it's more about cooking pork and then putting sauce on it and I'm not a big sauce guy. I like a really good bark, which is what smoke puts on it to make that dark outside and I like it to be really flavorful and kind of spicy. I used to really like Jimmy's in Lexington, but it closed down. Mac's Speed Shop in Charlotte is really good, too. But when you cook so much of it, you tend to not pick that as a meal.